Underfuse is an iron-on performance pocket designed to adhere to workout clothing you already own. 274 backers pledged $12,808 to help bring this project to life. Hi! Thanks for stopping by and checking out the project. Your pledges will make Underfuse a reality and will change the way you work out! Underfuse is a performance iron-on pocket specifically designed for working out, running, and travel. It can be used to hold your phone, mp3 player, keys and cards. The pocket is joined to a special woven fabric infused with adhesive. The adhesive is specially formulated to bond to your favorite workout gear with a regular household iron. 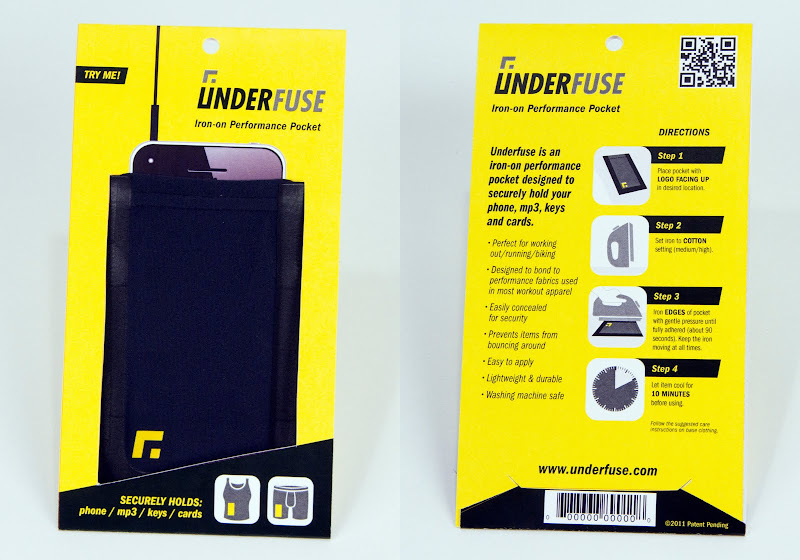 Underfuse has been tested to be as durable as the item your are attaching it to. Why Underfuse? The current methods of holding your items while working out are inadequate. When you are at the gym or out for a run you always struggle to find a good spot to put your phone, mp3 player, keys and cards. 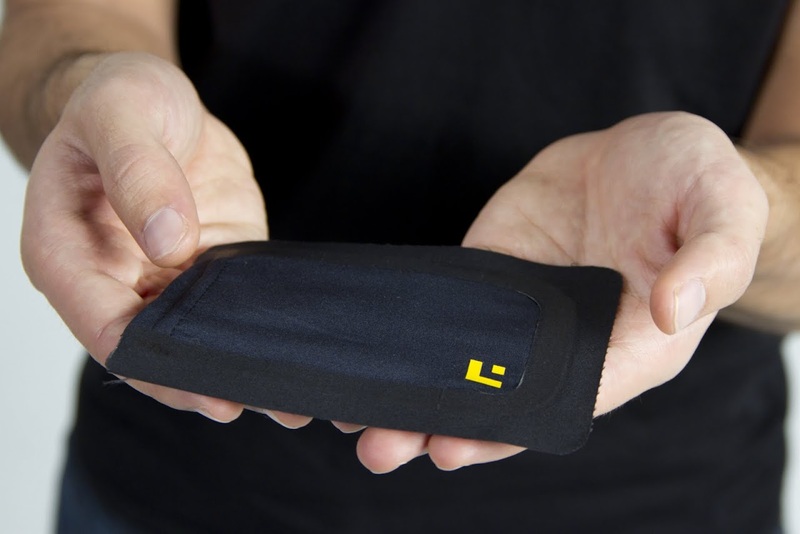 If you put it in your pocket then its bouncing around when you run or falls out when you lift or do sit-ups. Many women don't even have pockets on their workout clothing! Underfuse solves this. 1 Underfuse pocket along with branded packaging/directions. Try out Underfuse on your workout gear. 3 Underfuse pockets along with branded packaging/directions. Outfit some of your workout gear with Underfuse. Underfuse & compression shorts already joined. 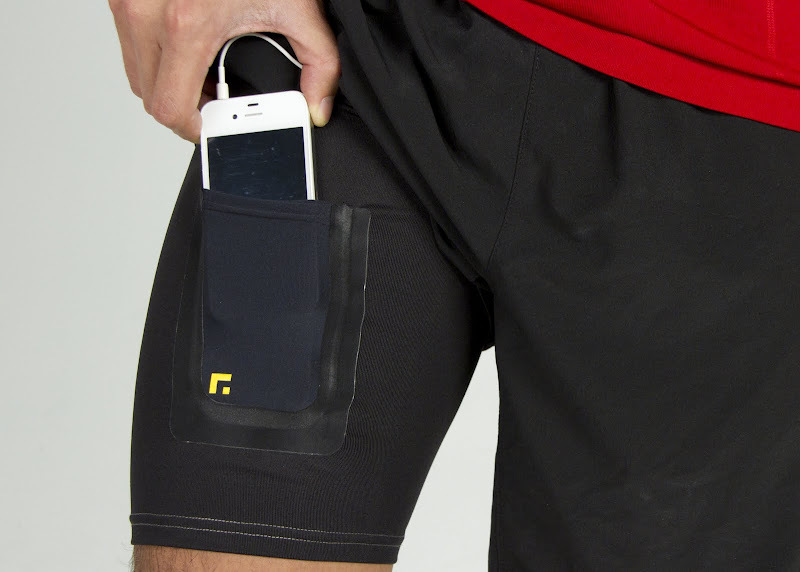 Get Underfuse already bonded to compression shorts. Pick a pair of compression shorts at the link below; Underfuse will be fused to the right thigh. Once funded we will send out a survey asking for your color and size preference, link below is just for reference. 10 Underfuse pockets along with branded packaging/directions. 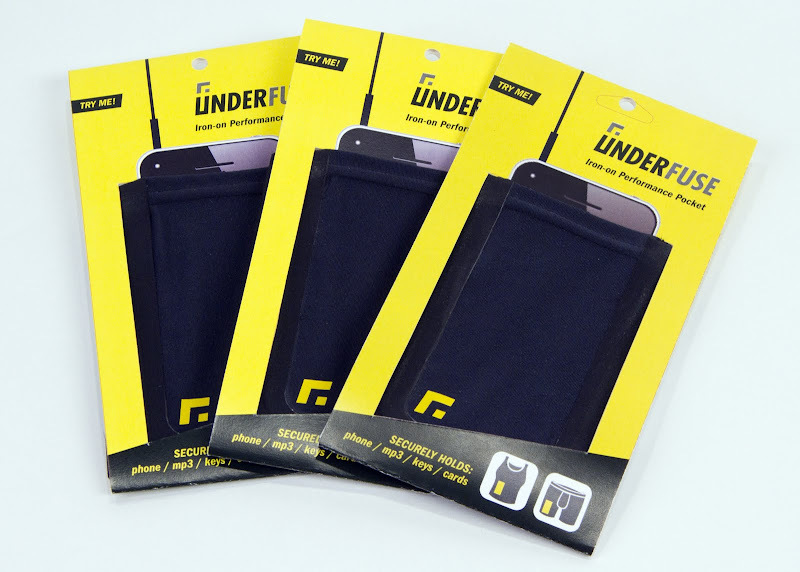 Outfit all of your workout gear with Underfuse. 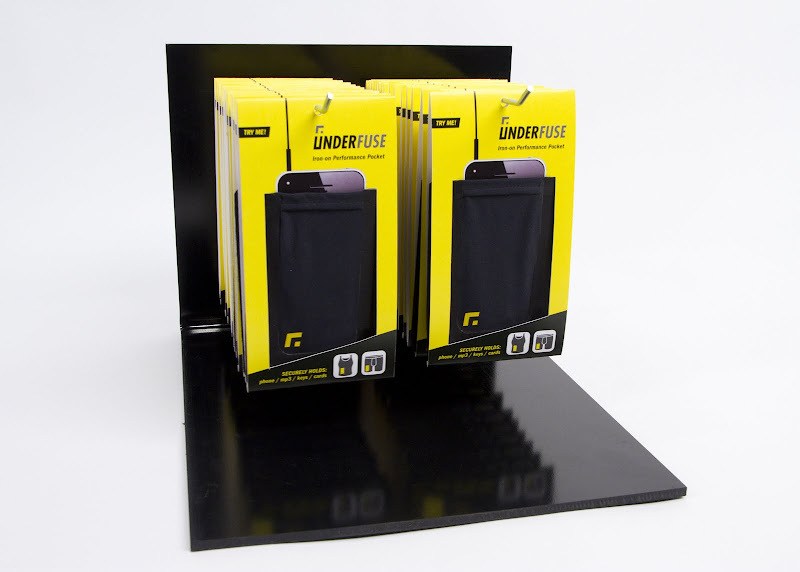 30 Underfuse pockets along with a point of purchase display so that you can start selling Underfuse. This is great if you want to be the first gym or retailer in your area to carry this unique product. You can also order this without the display if you have your own. Will Underfuse work with my smartphone? 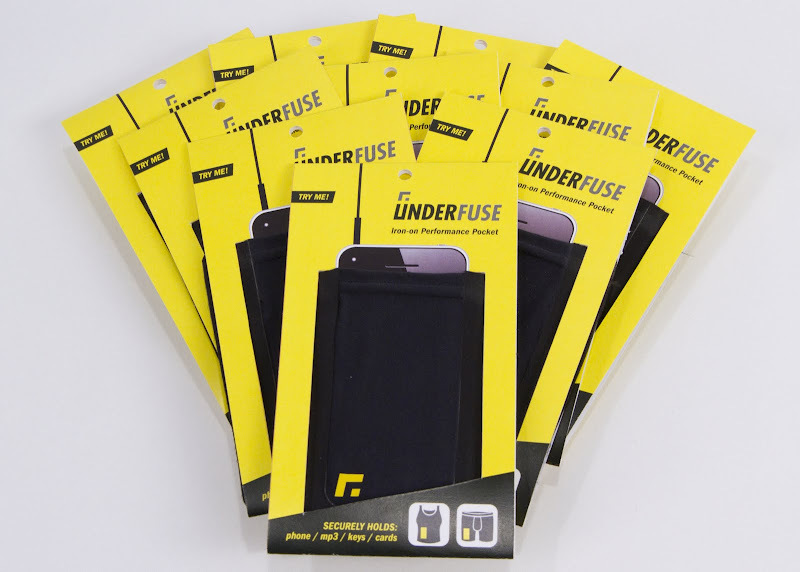 Underfuse is designed to work with all iPhone models (original, 3G, 3Gs, 4G, 4Gs), iPod Touch, most Android phones, most Blackberry phones, and all Palm/HP phones. If you want to know if your phone will fit just contact me and I will let you know. Where should I place Underfuse? Will Underfuse bond to my clothing? Underfuse is designed to be bonded to performance textiles such as those made by Nike, Under Armour, Lululemon, Adidas, and many others. It will also bond to other fabrics such as cotton. How should I wash my gear? Why are you raising $11,500? Great question. The factory needs to special order some of the materials to make Underfuse. Once they begin producing Underfuse they need to utilize all of the material so that they aren't left with any unused raw material at the end since they wont be able to use it elsewhere. In addition to that there is tooling that needs to be created for manufacturing. So when all is said and done the first production of pockets will cost $11,500. Underfuse has been tested to safely bond to performance fabrics (polyester and spandex based) however it is a good idea to make sure your apparel can handle the heat before product application. 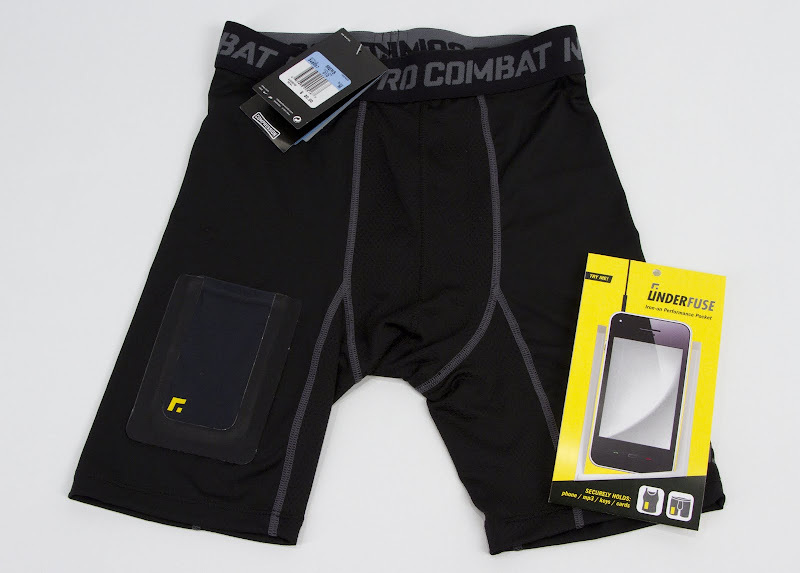 Get Underfuse already bonded to compression shorts. The compression shorts will be the ones located at the link below. Once funded we will send out a survey asking for your color and size preference, link below is just for reference. Underfuse will be fused to the right thigh.